Recorded on December 21, 2010. Hey guys, I made it to the end. I voted for Jason Young. What I’ve told people who asked me who to vote for or whatever in general is “whatever one they think was best.” Which I think is fair enough. I have a mild fear Dave Sim is going to ask me to withdraw it anyway. So despite only being 3 when this thing originally aired & that’s the only time I’ve seen it, I do remember thinking it was pretty awful & I fell asleep during an ad or something. 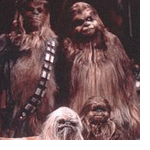 But I clearly remember the wookie in an apron & getting pissed off about it. But I looked up the Boba Fett cartoon just now & re-watched it. It was fine, but strangely didn’t look too much like my memory of it. My memory of it had a watery distortion going over the whole thing, which may involve not having a good TV. The animation is pretty French looking & surpisingly the Droids cartoon is stylistically similar…. I had a similar thought about the Droids ‘toon, but it’s been so long since I’ve seen it, I wasn’t sure if I was making that up.